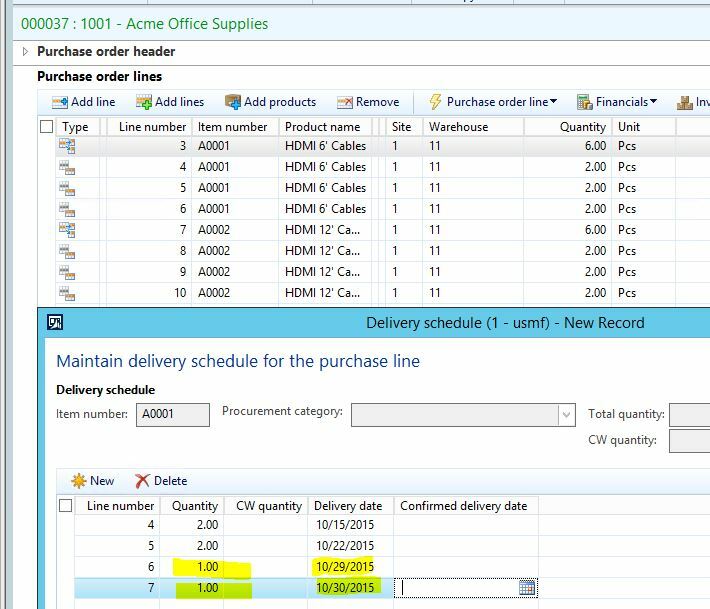 I’ve recently come across a couple of customers that were having issues modifying previously created Purchase order Delivery schedules. This typically happens if we have at least 2 items on a purchase order, both of which contain a delivery schedule. 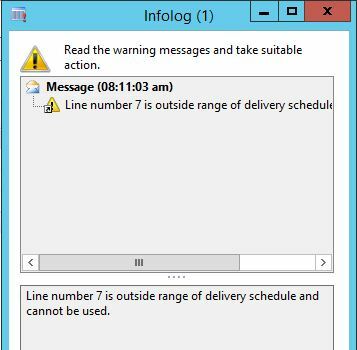 If needing to add a line to one of these existing Delivery schedules, we are seeing an error being generated that prevents the change from being saved – “Line number x is outside range of delivery schedule and cannot be used.” This was pushed up as a bug, but was declared as “By design” behavior, and a workaround was provided. 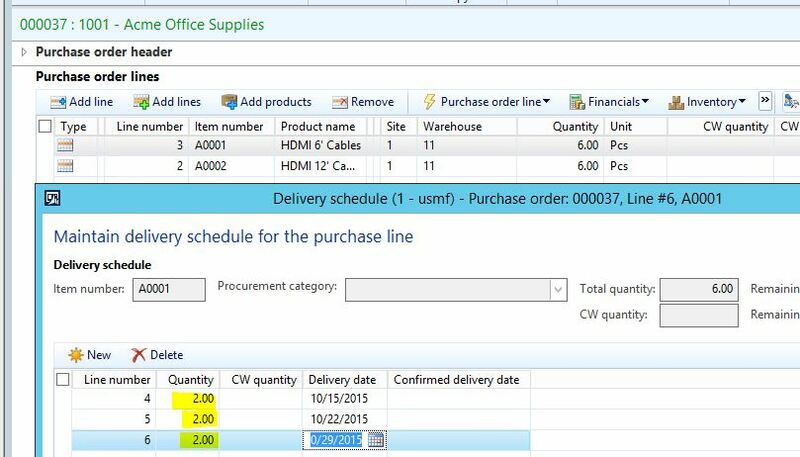 I will walk through the process below for creating a purchase order with delivery schedules, and the suggested workarounds for overcoming this error. 2. Create a delivery schedule for the first line. I have 6 pcs being purchased, so I’ll break my delivery schedule up into deliveries of 2 pcs. 3. Select your 2nd line (which should now be line number 2), and create an equivalent delivery schedule. 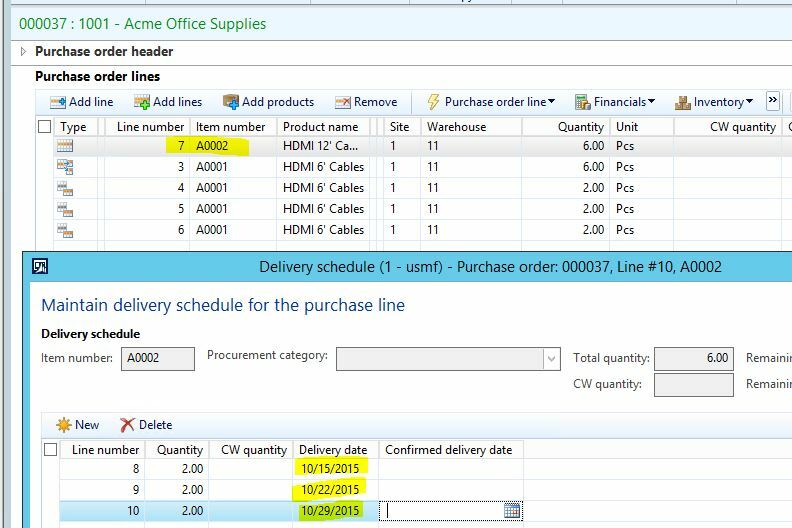 When the delivery schedule form generates, you will notice that line number 2 has now switched to line number 7 on the Sales order. 4. Our Sales order and Delivery schedule will now contain 8 lines – 2 lines for the original sales order lines/quantities, and 6 delivery schedule lines (6 sets of 2 pcs). 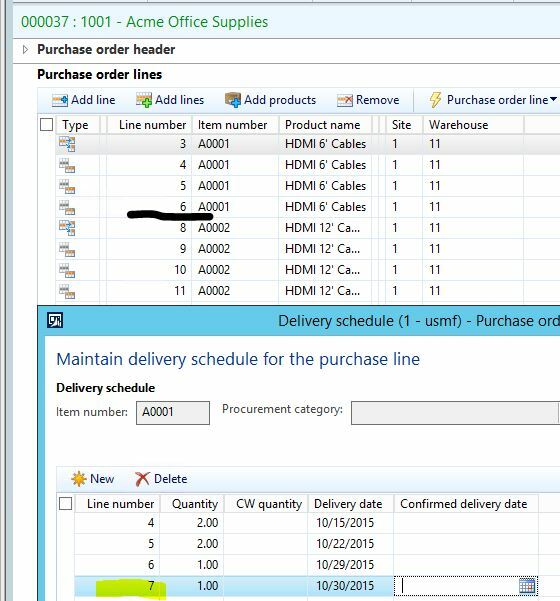 I have highlighted the original Sales order lines/quantities in the screenshot below. 5. We next decide to modify our existing delivery schedule. We get a call from the vendor stating that the final delivery of item A0001 will need to be broken up into 2 deliveries because of a backlog. Therefore, we have to split the final delivery into 2 separate deliveries of 1 pcs. We select line number 3 on the sales order, and access the delivery schedule. 6. We decrease the final delivery to 1 pcs, and add a 4th line for 1 pcs, delivered the next day. 7. When attempting to save these changes, the error is generated. As you can see from the screenshot, line number 7 is already taken by one of the lines in the original sales order. 1. Change the ‘System line number increment’ from 1 to 10. Whereas the current setup allows line number generation of 1, 2, 3, etc, this new setup would change numbering to 10, 20, 30, etc. 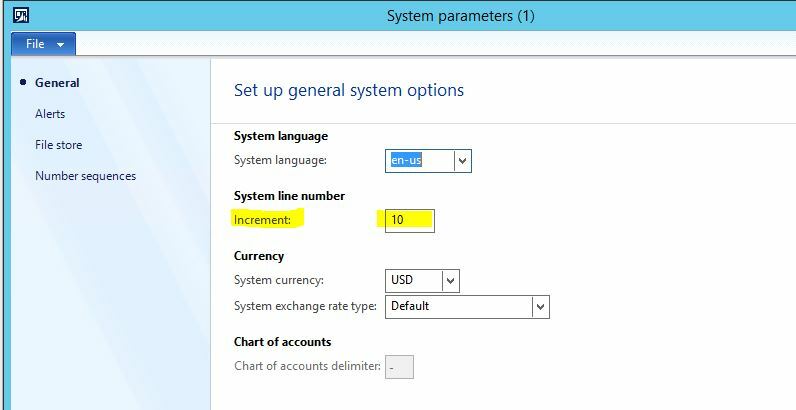 If you navigate to System administration > Setup > System parameters, on the General tab, you can change the ‘System line number increment’ from 1 to 10. 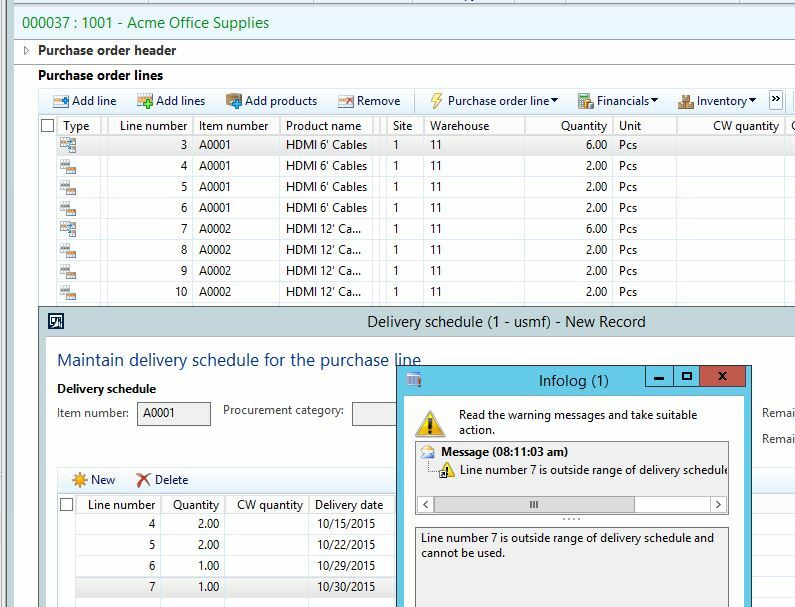 See the screenshots below to observe the affects of this change on the Sales order and corresponding delivery schedule. Note that the delivery schedule line now separates into increments of 5 for lines added after the initial creation of the delivery schedules. No modification to the purchase order line numbers is ever required with this workaround. 2. Manual modification of the Purchase order line numbers before changing the delivery schedule. For example, we have lines 3-6 that represent Item/Delivery schedule 1. Lines 7-10 represent Item/Delivery schedule 2. In order to add a delivery schedule line to Item 1 (3-6), you would have to change sequence 7-10 to 8-11, therefore allowing line number 7 to be added to Delivery schedule 1.